Frankie Dettori's victory on Galileo Gold. 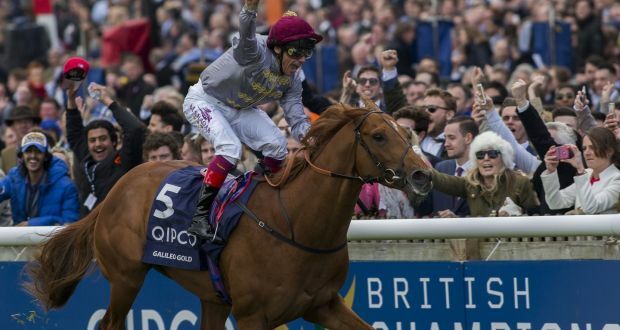 Frankie Dettori's victory on Galileo Gold was really praiseworthy and he showed the world how to ride a wave. We must say that was a big-race success. If you watch closely Dettori was always close to the pace from a tricky draw in stall one on the far side and moved closer to the lead approaching the final quarter-mile just as it became clear about Air force blue was going backward. It was a clever move, though. “It was my dad [Gianfranco, on Wollow] 40 years ago, it was me 20 years ago [on Mark Of Esteem] and now today, it’s brilliant,” Dettori said. “I had faith in the horse, I knew he’d be in the first three." “I knew he was good, but I didn’t expect him to be that good first time up. Physically, he’s done really well. He was just legs last year but he’s filled up his big frame." Guys if you want to know more about Frankie, then you should watch the video below. Biga news guys. I willa be carrying the Olympic torch ata Ascot nexta week. Coulda be tricky as eets a bigger than me!! !